I can’t believe I’ve never read any novels by Michelle de Kretser. This is an odd memory, but I remember when I moved to London over 10 years ago de Kretser’s novel The Lost Dog had a lot of shelf space at both Brisbane and Changi airports yet I didn’t buy a copy despite buying a few last minute Australian novels to take with me. Perhaps I’ve always assumed I’d not enjoy de Kretser’s work; perhaps I categorised it as commercial fiction. How wrong I was! 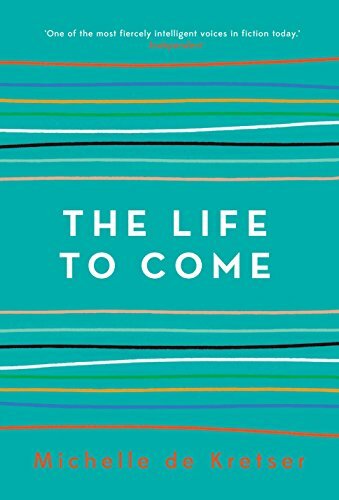 After reading The Life to Come I’m a little giddy with excitement that I have all her previous novels waiting there for me to read. So yes, I really enjoyed this novel, particularly the lovely writing style that I found rather soothing. The novel is more of a collection of short stories with all the characters loosely linked through Pippa, a self absorbed character rather insensitive to others but you don’t really need to like her to enjoy the stories. I personally preferred the first two chapters, particularly ‘The Ashfield Tamil’ to the later ones and I did wish that the overall story would keep following Ash and the characters we meet early on. The novel makes a number of interesting (and probably accurate) observations about Australians and literary culture. For example, I liked it when it was suggested to Pippa that she write about the suburbs of Paris where the metro goes above ground, explore the shops underneath the tracks as that’s the real Paris, to which she replied that’s not the Paris Australians want to read about. True. Overall, this is a novel I enjoyed reading particularly as I discovered a new author with a reasonable catalogue of books I can work my way though. The big question is – will it win the Stella Prize? No, I don’t think so. I think it is too big and sprawling in scope and the Stella seems to prefer smart, succinct stories. The Life to Come makes lots of relevant observations about Australia but none are particularly incisive. This novel was like a nice warm blanket keeping me cosy and comfortable rather than forcing me to join a polar bear swim club on an icy winter day. And that is alright by me! I haven’t read this yet, but it’s on the pile. I’ve read a few de Kretsers – The Hamilton case, The lost dog and Questions of travel. I’ve liked them all, but I particularly loved Questions of travel. It’s a bit sprawling in a way too but so insightful, particularly about travel, though also about refugees/migrants. Interesting! I’m halfway through this book and although I’m enjoying it I do feel that some of the themes are similar to those in Questions of Travel (which I really enjoyed). I agree that it’s probably not the Stella winner (for the reasons you stated). I reckon Terra Nullius will win.